I walked into the larger of Joseph Audio's two demonstration roomsthe one shared with Nagra and Kronosjust in time to hear Neil Young's "There's a World" and "Bad Fog of Loneliness," from the Live at Massey Hall LP. 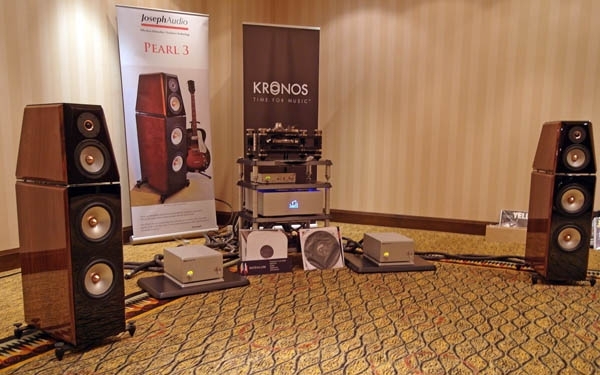 The performancesand Young's very funny between-song patterwere thoroughly convincing, and even in this large space, there was a sense of the Joseph Audio Pearl 3 floorstanders ($US31,500/pair) pressurizing the room to realistic good effect. I loved the Pearl 3sand so, apparently, did Nagra's Classic Amp ($US16,000), a 100Wpc stereo amp that runs in class-A for its first 10 watts. (For this system, Nagra's Sales & Marketing manager, the noted recordist Rene Laflamme, elected to use a pair of Classic Amps, as unbridged monoblocks.) Also in the system were Nagra's Jazz preamp ($US12,800), a prototype phono preamp from Kronos (price TBD), and the Kronos Sparta turntable ($US21,500) and Helena tonearm ($US6500), with ZYX Omega Premium phono cartridge ($US7500). Cabling was by Kubala-Sosna, and the equipment rack was by Modulum. 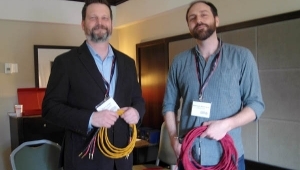 Montreal Salon Audio marked the return of L'Atelier-Audio, a dealer-distributor and manufacturer of cables based in Montreal. L'A demonstrated a limber, well-textured system built around a pair of Offrande Supreme V2 stand-mounted speakers ($CDN9900/pair) from J.M. Reynaud. (The first North American review of Reynaud Offrandes appeared 20 years ago in Listeneryay!) 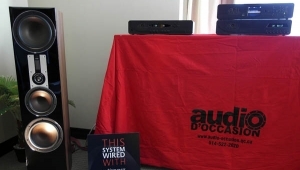 Rounding out the system were the 10Wpc class-A Audio Project integrated amp from Germany ($CDN3500) and a Metrum Acoustics Pavane DAC ($CDN7000). Wynn Audio, the Canadian distributor for the Swiss company Goldmund, demonstrated a pair of that company's Metris Tower ($CDN30,000/pair), a wireless loudspeaker that's internally tri-amped (75W for the tweeter, 100W for the midrange driver, and 150W for the woofer). The wireless technology used is Goldmund's own: as with other models in their growing line of wireless speakers, the Metris Tower comes with a dongle for use in the owner's computer or smartphone. When I first entered Wynn's large demo room, they were playing a piece of music that sounded like something by Phillip Glassit may actually have been Phillip Glassand I thought it sounded pretty good. I can't identify for you the big, un-subtle dance music that was playing in the Tannoy room when I dropped by. (Later on, distributor Rich Zidel told me it was one of the selections suggested by his 18-year-old daughtera topic of conversation that made this father of an 18-year-old girl smile, too.) 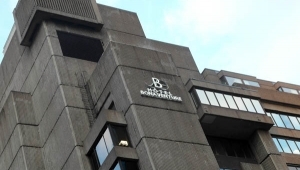 But I couldn't help thinking that whomever composed and performed that record would find much to enjoy in the Tannoy Kingdom Royal loudspeaker ($CDN90,000/pair), which was physically big and unsubtle. (The leather trim, like the gold-anodized metalwork, is delightfully over the top!) The source component was a Linn Majik DS server, all other electronics were from Bryston, and the room had been treated with printable (!) acoustic wall panels from Prime Acoustic. And, yes, the Tannoys also did an impressive jobtremendously wide bandwidth, thunderous dynamic peaks, and awesome spatial scalewith music of greater subtlety. Even the Eagles. Much as I am not an Eagles fan, I am also not really a U2 fan. (In the cases of both bands, I don't really dislike their musicI just don't go out of my way to hear it.) For me to actively enjoy U2 would take either a live performance of an especially good playback system. And the combination of the Clearaudio Innovation record player ($$CDN20,985), the stylish Micromega M-ONE integrated amp/DAC ($$CDN5495), and the no-less fetching Focal Sopra No1 loudspeakers ($CDN9999/pair) had me actually quite enthused, almost to the point of choogling away on air-guitar, in mute tandem with The Edge. 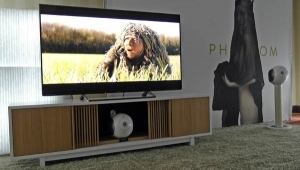 Two news stories came out of the room shared by Gershman Acoustics and Oracle Audio Technologies. Ofra Gershman (seen in the photo above) unveiled her company's new Inspiration floorstander ($US5900/pair), which aims to offer, in an easier to build and thus less costly enclosure, the same structural enhancements as in the cabinetry of their more expensive modelsin particular, rigid internal compartments for the drivers, executed with non-parallel surfaces. For his part, Jacques Riendeau of Oracle unveiled, in prototype form, his as-yet-unnamed new AC-motor, belt-drive turntable, which is intended to sell for $US2000 with tonearm and cartridge. The tonearm in question is a tidy-looking unipivot, features of which including a sliding Delrin ring for the armtube that serves as both a damper and an adjustment that can be used for matching effective arm weight to cartridge compliance. Lightly used LPs, those still-unravish'd brides of unquietness, reveal musical truths, beautifully. What, then, could be more beautiful than several hundred LPs (for sale at reasonable prices)? So it was at the kiosk sponsored by Pleko Vinyle, overseen here by proprietor Martin Landrywho also offers LP cleaning, also fairly priced, on a Keith Monks machine. That's all you need to know! Monitor Audio took advantage of the revived and renamed Montreal show to unveil their new flagship model, the Platinum 500 ($US28,000/pair). The 7-driver floorstander is a three-way design built into three stacked boxes, and featuring a new air-motion transducer for high frequencies and newly designed multi-layer cones on the low-frequency drivers. 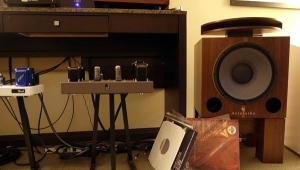 The Platinum 500s were driven with a Simaudio Moon 870 stereo power amplifier ($US22,000), itself preceded by various Cyrus Audio products: their PreDac 2 preamplifier/DAC ($US2500); an accessory power supply for the latter, called the PSXR ($US1500); their XA streamer/DAC ($US3000); and the Cyrus CDT dedicated transport ($US1500). The system, which sounded impressively big, open, and colorful, was wired-up with Claris cables. Splendid show coverage once again. Although (unless I missed it) it IS possible to do an entire show report without a single picture of that kid from VPI. Let it be said that you have really turned the tables on the "Stereophile" coverage. Later that day at an event, I complimented Art as a real trooper for being in our room when he was. The music in question was Disclosure's The Mechanism, which is an awesome example of electronic music of the variety not often played at HiFi events. Art was a trooper because we were playing it on the very loud side, by request, not rave level, but LOUD nonetheless. Our music spanned all tastes and volume levels, and Art happened to drop in on the louder than it should be portion of the day. The guests of the show had fun, as did we, and we dropped in and out of audiophile mode to suit the public. I do wish however, that I had had the chance to play something else for Art as well, not an audiophile demo, just some real music at a slightly more moderate level. Hopefully he will visit with us again next year.